The Liberals’ decision to introduce back to work legislation and end the CUPW strike threatens free collective bargaining and the right to strike for all unions and workers in Canada. The government’s argument that the strike threatened small businesses and consumers at the height of the holiday spending season doesn’t hold water. CUPW never closed down the post office, the strikes were rotating and the mail was always moving. Further, the union had promised the public that it would deliver government cheques, medicines, and other essentials in the event of a complete work stoppage. There was never an emergency. There was no reason to end this strike. Except of course to respond to the demands of Big Business which wants the government to break the union and privatize this crown corporation. That’s the compelling argument to end the strike from some of the government’s biggest supporters and financiers. Just check the donors’ list to the Liberal – and Conservative – Party over the decade. The postal workers were forced into a strike in the first place because Canada Post knew it could depend on the government (Liberal or Tory) to order them back to work. There is no incentive for this employer to negotiate anything – and they haven’t – for more than a year. What’s at issue is implementation of a pay equity ruling which the union won and the employer is ignoring. A level of workplace injuries that is five times higher than any other workplace in Canada. Twelve hour work days, compulsory overtime, precarious work and part-time workers. A workplace that should shame any employer, let alone a public employer that should set an example of fair collective bargaining, not be the example of bad faith bargaining. The PM, who claims to care about labour rights and standards, has allowed this employer to undermine free collective bargaining, and must take full responsibility for the consequences. Canadians will remember this betrayal in next fall’s federal election. While the CEO of this Crown corporation continually points to the changing nature of mail service in the digital age, CUPW has provided a road map for how the post office can deliver a whole range of new services for the public including postal banking. Instead of picking up these innovative ideas, the Liberals killed them in a Parliamentary vote this month. Postal workers want a collective agreement. Big Business and the Liberals and Tories want to privatize Canada Post and break the back of the union. The Communist Party stands with postal workers and their union, CUPW, in what is now a battle for the rights of all workers to strike, and to free collective bargaining. 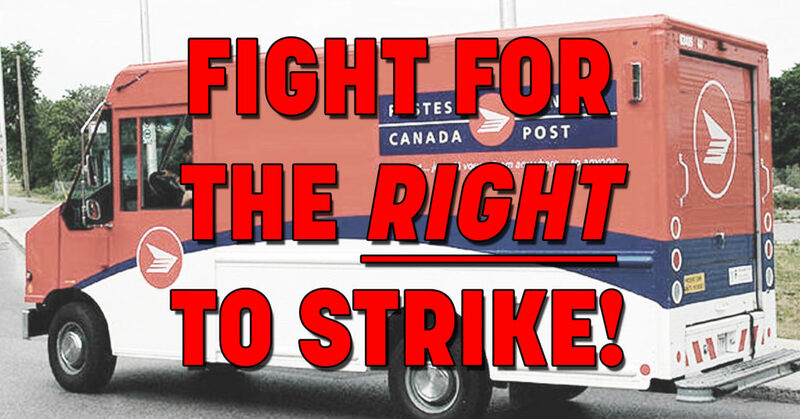 We call on the labour and democratic movements to support the continuing struggle of postal workers to force Canada Post to negotiate a fair settlement and to repeal anti-labour back to work legislation now. We also demand that Parliament adopt a Labour Bill of Rights guaranteeing the unfettered right to strike, to free collective bargaining, to organize and picket for all workers in Canada. The actions of the employer, the government, and the Tories in this strike prove that a Bill of Rights for Labour is urgently needed to protect the interests of workers, their trade unions and free collective bargaining in Canada today.